Looking for COBRA administration tips? Looking for COBRA administration tips? Thinking about COBRA outsourcing? 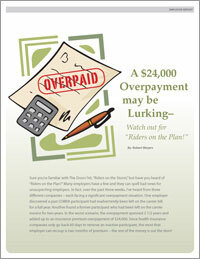 Worried about a COBRA overpayment? You’ve come to the right place. Click on any of the following free COBRA reports to instantly download information to make your job easier. Is COBRA outsourcing is the right choice for you? This insightful report will help you make an informed COBRA outsourcing decision, saving you time and money. 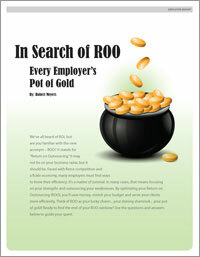 Learn how to leverage COBRA savings opportunities and what to do before you outsource. Get COBRA outsourcing info now. Learn from other companies’ mistakes by downloading our free report. Learn how a COBRA overpayment can cost your company thousands and the steps you can take to avoid this costly predicament. Download this free COBRA info now. 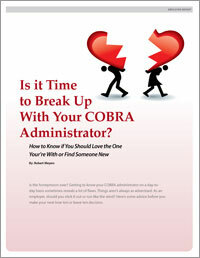 Is it time break up with your COBRA administrator? Read this report first. Discover some great reasons to run like the wind and along with a few other reasons to stick it out. 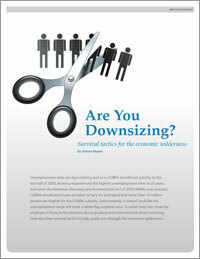 Download this insightful COBRA info now. Does open enrollment give you a sinking feeling? Benefit plan changes are time-consuming enough, but keeping up with COBRA participants before, during and after open enrollment can be treacherous. 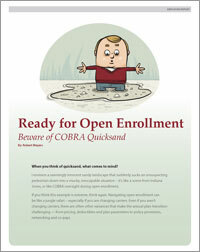 Download our COBRA report “Beware of COBRA Quicksand” and learn how to avoid the COBRA mistakes that occur during open enrollment. Downsizing? Planning a layoff? Read this first! Download our free report “Cobra Survival Tactics for the Economic Wilderness” and get an overview of state and federal COBRA requirements, COBRA timeline extensions, and cost effective downsizing strategies. Don’t be left alone in the economic wilderness! Are all your COBRA participants REALLY eligible for COBRA? 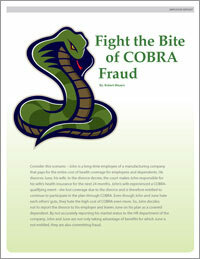 Download our free report “Fight the Bite of COBRA Fraud” to discover important steps to help you fight the bite of COBRA Fraud.